I thought I’d republish them back to back. Two years ago, the worst time in my life, so glad it’s all resolved. God is good now, and was good then. In my last blog I talked about terror, and shared the story of my recent car wreck. I hinted that my children had the ability to take me to a place of fear 100X greater than the wreck. And so, part two. The reason I was trying to get home over the mountain at night was because I wanted to maximize my time with my son Micah who would be coming back from Burning Man. He had only two days in Reno before heading back to Fort Bragg. We had a good last two days, and then David put him on a plane back to his base. The next morning I received a call that Micah didn’t show up for work. At first we thought, “Oh, it’s just like Micah to get home late and not realize he has to be at work right away. He probably thinks he starts tomorrow.” But, just in case we decided to check with the airline and look at his bank account. He had made it all the way to Fayetteville, North Carolina where Ft. Bragg is located. Then, he’d gone on base, filled up his car and then emptied his bank account. So, he had either been robbed (beaten, lying on the side of the road dead?) or gone AWOL. Panic set in. Two hours later, after a conversation with my daughter, we found that he’d talked about going AWOL at Burning Man. In fact, they’d had a big fight about it. She was sure he’d changed his mind by the end of the week, so she didn’t mention it. Our friends and family stood with us and sustained us. And there were glimpses of God. One morning I was so despondent I prayed, “I just want to know that you are with me. It would help if someone I didn’t even really know was praying for me right now. I need to know you see me.” After that I took a shower and when I came out my husband had put the mail on the dresser. In it was an envelope addressed to me from a woman I hardly know – I met her two years ago at a women’s retreat. On the outside of the envelope was a picture of birds. Under it she had written, “He is watching over you.” Inside was her assurance that I was not alone and she was praying for me! It was so unexpected, so needed. I cried tears of thanksgiving. We were so relieved, he was alive and safe! Our worry for him continues. We know he needs to go back to the base ASAP. We held on to the hope that he would contact us again this Sunday. When he did not, we again sunk into despair. We held each other in bed that night and cried. 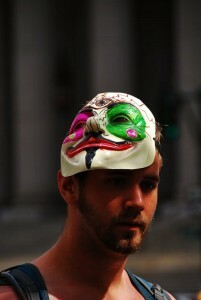 Monday morning my husband had an inkling: It was the one year anniversary of Occupy Wall Street. He went to a Flickr and put in Occupy Wall Street into the search engine. After two hours of searching he was rewarded with the above picture of our boy. Another glimpse from God. We are not alone. We stand with so many who are praying with us, and God continues to sustain us. Many of you are going through equally difficult times right now. Let me know what they are so we can hold each other up. These things are too much to bear alone.